While we most often associate addiction to a substance, addiction can be attributed to anything that becomes an obsession. Ever wonder why how it’s possible for some people to be social drinkers, while others can’t go one night without popping a cork? 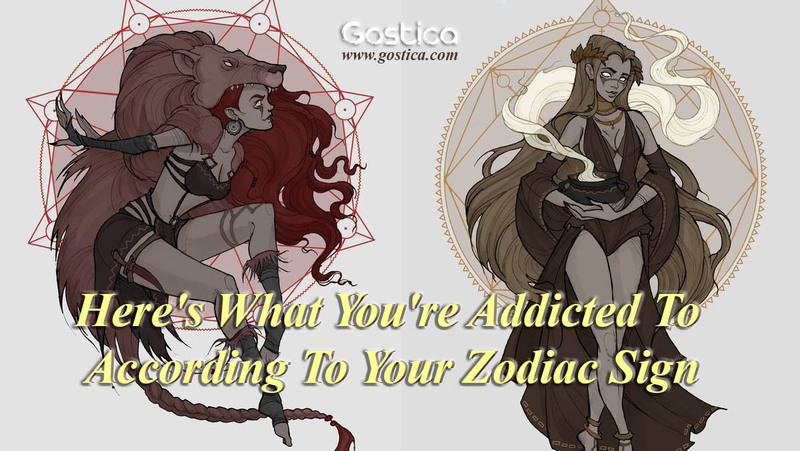 Perhaps there’s an answer lies in one’s zodiac sign. While other factors in the birth chart play a part, considering one’s sun sign opens a doorway to understanding the root of one’s insatiable urges. It’s important to note, however, addiction should never be taken lightly. Below you will find the addition of each Zodiac sign! Ruled by dreamy Neptune, the Pisces is a sign of the deepest waters and requires escape from their intense empathetic nature. Pisces, like Scorpio, is a private sign but also extremely compassionate at the same time. They are intuitive and their connectedness to the inner worlds of others is exhausting. This makes escape an addictive pursuit. Whether it escapes through sleep or alcohol, the Pisces can go to the extremes of leaving this world in order to enter another. Ruled by Uranus, a planet of change and the unconventional, water-bearing Aquarius operates almost entirely in the mind. From one Aquarius to another, the knowledge seeker is insatiable when it comes to information. At the center of the Aquarius is a person on a quest to understand the ins and outs of everything from ancient civilization to futuristic trends of technology. Aquarius is the quintessential ideas person. Whether it’s multiple windows open on the computer or reading multiple books at a time, the Aquarius is addicted to input. Ruled by Saturn, a planet of discipline and responsibility, Capricorns are dedicated and devoted to their work. There lies a strong difference, however, between strong work ethic and becoming a workaholic. Capricorns have been known to light both ends of a match. Because steadiness is what the Capricorn is known for, the drive becomes a need to improve and perfect. But everyone–even ambitious Capricorn–deserves a break sometimes. Jupiter bestows luck and the insatiable wander-lust to optimistic Sagittarians. Because these freedom-loving wanderers always have their arrow pointed toward the next horizon, traveling allows them to remain uprooted and satiates their philosophic meanderings. These expansive people feel that traveling is as vital as breathing. Traveling for the Sagittarius is intertwined with the insatiable chase for greener grasses. Let’s face it—Scorpios love investigating the dark side. Ruled by Pluto, the netherworld of the dead, Scorpio is obsessed with probing to the deepest, darkest layers. Scorpios appetite for passion and observing the dark underbelly of the society. The Scorpios love digging into the psyche of the human condition and can’t help but be drawn to witness the rise and fall of power dynamics. It’s just simply part of their idealistic nature. How did the ever-charming Libra dodge confrontation before the invention of the smartphone? Ruled by Venus, Goddess of love and beauty, the Libra wants nothing more than to create equilibrium and beautify his or her environment. For the Libra, the idea of rocking the boat stands as a fear, for the Libra is the ultimate people pleaser. Libra is also an air sign and requires communication. It’s no wonder then, a smartphone allows Librans to avoid confrontation. In fact, when a Libra feels one brewing, out comes the phone and up goes the shield. Smartphones are a Libras go-to social tool and their go-to vice. For the efficient workaholic, nothing keeps the jive going like a hot cup of coffee except being followed by another cup of coffee. Virgos are work and project-oriented, ruled by quick-witted mercury, they rely on a steady flow of stamina. There’s no better way to keep up the energy to keep up with the work than a steady stream of caffeine. Logical Virgo most likely already has a coffee maker near his or her work vicinity. What better way to create a platform for the regal life than Instagram? Exuberant Leos know how to shine a golden light on their lives—they are ruled by the sun after all—and in doing so, they receive the steady flow of attention that is quintessential to their happiness. Besides all that dramatic flair demands an audience! Instagram allows Leos to project the reel of their lives onto the (small) screen. Forever the loyal crab, sensitive and emotional, Cancers are serial partners to emotionally inept people. Because of their empathetic nature, they tend to collect broken people in hopes of loving them into wellness. Unfortunately, one bad romance leads to the next. These charming mercurial beings love to chat, and clothing becomes a mode of communication as well. Ruled by fast-paced mercury, Geminis love to switch up their wardrobe. In fact, it’s imperative because they are constantly seeking a mode of self-expression for their ever-changing identities. Simply put, the reliable Taurus lives primarily through the senses. They want to experience all the pleasures of the material world. It comes as no surprise then, that when the going gets tough, chocolate fudge brownies and garlic breadsticks fuel the Taurus’ need for sensuous pleasure better than any other vice. For the impulsive, fiery soul, whose most notable trait is courage, Twitter’s immediacy allows Aries to express their thoughts to the world without the glitch of hesitation. Ruled by Mars, a planet of courage and competition, Aries has an inescapable need to project their personality and hesitation makes them uneasy. It comes as no surprise that Twitter can become a full-fledged obsession. Twitter is immediate and straight to the point, exactly what the Ram loves.